If you are not registered for online appointments booking you will need to obtain an online username and password from our reception staff. Please print out and complete application form. You can book appointments via telephone on 0191 282 1010 option 1, between 8:15am and 6pm Monday to Friday. Appointments for all healthcare professionals can be booked up to six weeks in advance subject to availability. 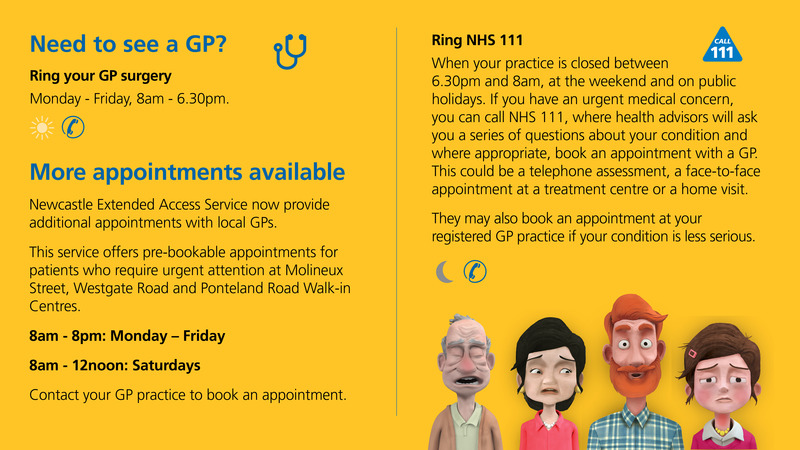 There will be a number of Medical Emergency appointments available each day. This service offers pre-bookable appointments for patients who require urgent attention at Molineux Street, Westgate Road and Ponteland Road Walk-in Centres. Please CLICK HERE for more information. If you are unable to keep an appointment, please let us know as soon as is practically possible so that it can be offered to someone else. Patients who miss an appointment and fail to notify us will be monitored and will receive correspondence from the practice if this happens more than 3 times. PLEASE NOTE: our GPs will be either working at Benfield Park Healthcare & Diagnostic Centre or in the Resource Centre at the Molineux Street NHS Centre, this will be indicated when you are booking an appointment. Please keep this in mind when booking your appointment online.